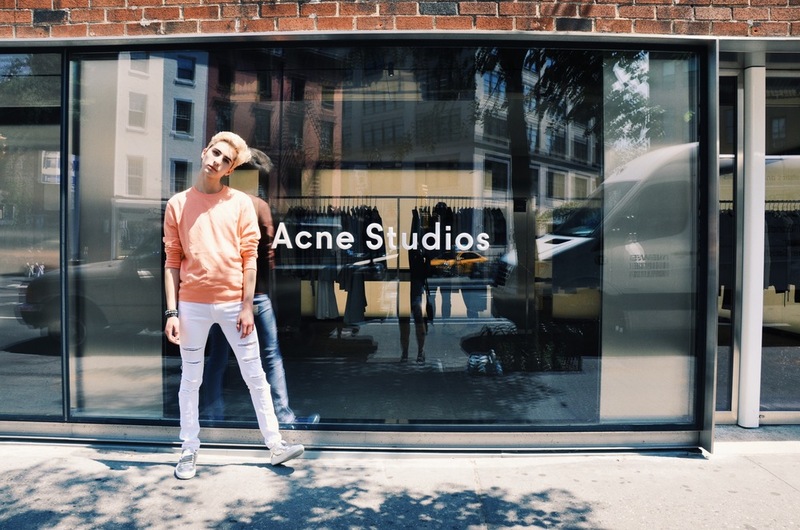 Pictured Above: Ryan Matthew wearing an Acne Studios Coral Melange sweatshirt, H&M white ripped jeans, and Acne Studios Adrian Metal Silver sneakers. This look is perfect for any cill summer day. It features two really cool pieces from Acne Studios—the crewneck sweatshirt and the funky silver sneakers. It is super comfortable to walk in, and the colors all work nicely together, too. For some extra fun, I added my studded YSL leather cuff and my Valentino rockstud bracelet. Acne Studios Adrian Metal Silver sneakers. In this look... Acne Studios Coral Melange sweatshirt, H&M white ripped jeans, Acne Studios Adrian Metal Silver sneakers, Saint Laurent spike bracelet, & Valentino Rockstud bracelet.